Clinically proven to visibly brighten skin overnight, reduces dark spots, refines pores, softens skin textue, and evens out skin tone in just one week by breaking down excess melanin on the skin. Targeted treatment for dark spots and uneven skin tone due to sun damage, post-acne dark spots, and aging. The recovery hydration complex of shea butter and jojoba oil renews dull, lackluster skin by infusing the face and neck with radiance-boosting moisture. Enhanced with rejuvenating benefits, the Night Cream is enriched with a unique skin-firming polysaccharide, which instantly tightens the appearance of the face and neck for younger-looking skin. Proven to work twice more effectively and faster than hydroquinone and other brightening treatments and without their harsh side effects. The dermatologist-tested, patented natural Luminaze Enzyme Complex is harvested from a mushroom (that grows on trees in the Swiss Alps) that depigments and brightens the skin by removing dark spots, evening tone and softening skin texture. Safe and effective for all skin types, ethnicities, and ages. Can be used on entire face, neck, decolletage, and hands. 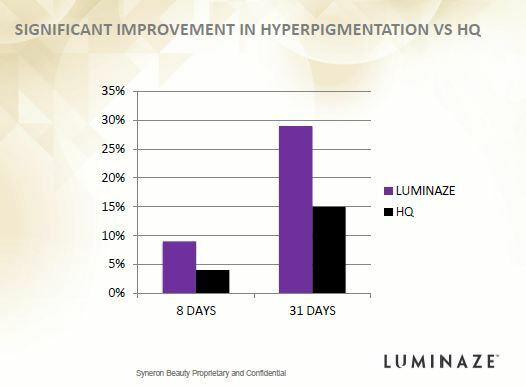 Luminaze is gentle enough to be used every day so the results will be quicker and consistent. Hypoallergenic, noncomedogenic, and formulated free of parabens, synthetic fragrances and dyes, sulfates, petrochemicals, phthalates, GMOs, and triclosan. Apply the Active Luminaze Enzyme from Compartment #1 evenly over face and neck. Apply the Bio-Activator from Compartment #2 over the same area. Why do Dark Spots occur? Everyday sun, pollution, acne spots and the natural aging process can take a toll on your skin, leading to dark spots and excess pigmentation. Skin can can start to look dull and uneven. Dark spots are often most visible on the face, chest, and hands. Customers looking for a targeted treatment for dark spots and uneven skin tone due to: age spots, sun damage, melasma and acne scars. Customers wanting a brighter, more even and radiant skin tone. Safe and effective for all ethnicities. 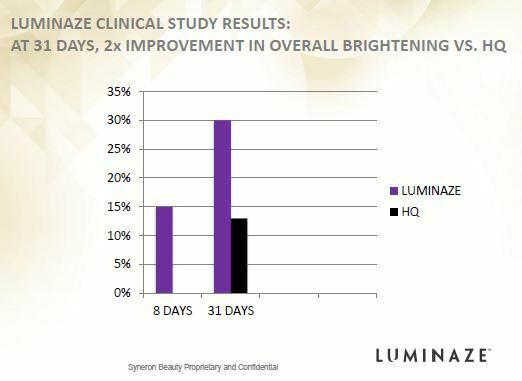 The Active Luminaze™ Enzyme is a patented natural extract harvested from a mushroom that grows on trees high in the Swiss Alps. The tree bark surrounding these mushrooms was found to be lighter in color than the rest of the tree. Amazingly, this potent enzyme has the same brightening action on dark spots and uneven skin tone. It's the first and only ingredient clinically proven to visibly break down excess melanin on the skin, revealing a more luminous complexion.